NASA engineers recently went on an auricle ride as a scale model of the Space Launch System (SLS), including solid rocket motors, was fired—giving an "earful" of information about how low- and high-frequency sound waves will affect the rocket on the launch pad. When completed, SLS will be capable of taking a crew and cargo on deep space missions, including to an asteroid and eventually Mars. 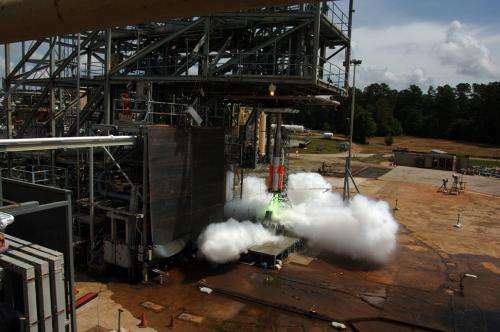 "This test is unique because it's like going through the steps of a true launch, only on a much smaller scale," said Jeremy Kenny, acoustics engineer at NASA's Marshall Space Flight Center in Huntsville, Alabama, where the test series is being conducted. "The noise the engines and boosters generate is so great that it can impact the rocket, and the crew, during liftoff. We have to ensure we have the proper suppression system to basically turn that noise down to a safe level." The scale SLS model hosts more than 200 sensors, which take data representative of the predicted SLS acoustic environments. The data collected from the tests will be used to help direct and verify the design of the rocket's sound suppression system. Water is the main component of the sound suppression system because it helps protect the launch vehicle and its payload from damage caused by acoustical energy. "When you're building the largest rocket in the world, you have to take everything into consideration," said SLS Chief Engineer Garry Lyles. "Acoustic testing is a very critical part of that. We're using testing techniques that were highly successful during the space shuttle era, and tailoring them to SLS design specifications. It's getting us where we need to be for the rocket's first flight." The first flight test of the SLS will feature a configuration for a 70-metric-ton (77-ton) lift capacity and carry an uncrewed Orion spacecraft beyond low-Earth orbit to test the performance of the integrated system; it is scheduled for 2017. As the SLS evolves, it will provide an unprecedented lift capability of 130 metric tons (143 tons) to enable missions even farther into our solar system to places like Mars.